Can-Am is as committed to safety as we are to producing products of the highest quality. Can-Am cabinets are equipped with safety interlocking drawers which allow only one drawer to open at a time, to prevent accidental tipping. Can-Am cabinets are made of steel so they can provide strength and durability at a reasonable weight. 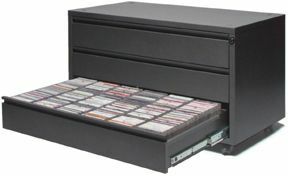 Can-Am drawers feature an integrated, full length, all steel finger pull. We also use full extension, industrial strength, ball bearing slides. cabinets are inter-connected with Safety Clamps for added assurance. Leveling feet ensure that your cabinets are stable and level. This is especially important for the base cabinet of a stack. The retracted feet of upper cabinets rest in recessed dimples found on all cabinet tops, for accurate positioning and added security. Can-Am Cabinets are linked with C-Clamps that fit into holes found at the back of every cabinet, anchoring cabinets to each other. No tools are required. Be sure to install these clamps when stacking cabinets. If someone else does your setup, make sure they do. from tipping by anchoring it to the others. outfitted with plastic bushings to keep your wires from contacting the cabinet or chafing. Caps are available to covers the holes if you are not using the cabinet for electronic equipment. Key Locks - Keyed alike. One key fits all. 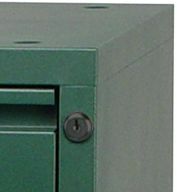 A lock is standard on all drawer cabinets for privacy and security. You may never use it, but it's sure nice to know it's there. A locked cabinet is also a safer cabinet. All locks are keyed alike. 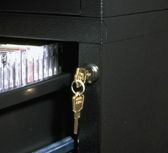 Black locks are used for black, brown, charcoal, navy, plum, or hunter green cabinets and silver locks for all others. Cabinets can be ordered without locks. Unlike wood cabinets that actually insulate your AV equipment, Can-Am metal cabinets absorb the heat from your equipment and radiate it away. They don't call Can-Am cabinets cool for nothing! Our flip doors slide out of the way so you can operate your electronics with the doors open, which allows the heated air to rise naturally and escape. Convection replaces the warm air with fresh cool air. and your walls. And if you live in a walk-up, this is your life-saver. Can-Am modular cabinets are relatively lightweight and are carried one module at a time. Can-Am cabinets are versatile and expandable. You can't outgrow them. Add to your setup as required. 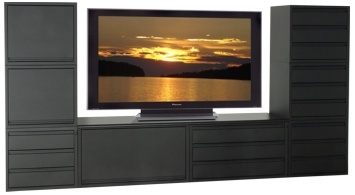 Reconfigure every time you change your TV or your home for that matter. This is your last AV cabinet. Obviously your electronics need a dust-free home, but what about your media? CD or DVD packages covered in dust is more than annoying. That dust can make it's way into your sensitive electronics. In the old days, before a top was fitted to the cabinet wrapper (the panel making up the sides and back), the top of the wrapper was first offset by the thickness of the steel, so that when the two were mated you could run your hand down and not feel any difference or see the unsightly edge of steel. Very few manufacturers do that anymore. We still do it. Offsetting the wrapper to accept the top seamlessly requires a number of additional production steps and forming tolerances must be critical. But it's worth it. That, among other things, many you can't see, make Can-Am cabinets furniture grade. Whether you put Can-Am cabinets in your basement or living room, you'll have quality cabinets that are built with a long history of proud workmanship. A soft exterior. A heart of steel. Can-Am builds AV cabinets for today's lifestyle. 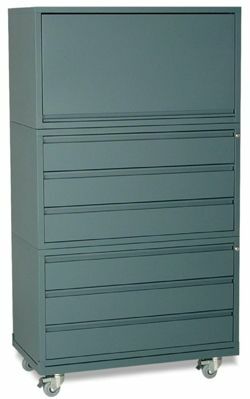 Our metal cabinets are finished in a rich powder coating. The powder coat is baked onto the cabinet for a tough, smudge and scratch resistant, polyester epoxy finish. Steel is a relatively lightweight and environmentally friendly material that will stand up to today's lifestyle challenges. Nothing is stronger or more durable. Steel is the material of choice for environmentally responsible furniture. It is completely recyclable. For an eco-friendly furniture solution, you simply can't do better. If you are looking for ways to do your part for the environment - steel furniture is one way you can help. No trees are cut down and steel cabinets never end up in landfills. In the cabinet manufacturing process there is always cut-off material or scraps. Wood scrap is often carted off to landfills or burned. Metal scraps are valuable and necessary in the production of new steel. Nothing is wasted and nothing gets thrown out. Everything is recycled. Breathe Easy - It's Hypoallergenic ! With steel you also don't get the VOCs (volatile organic compounds) normally present in wood and laminate furniture - primarily from the resins, stains and adhesives used in the building process. Less VOCs means less environmental impact, and less impact on your allergies. People who are sensitive to the volatile compounds emanating from wood furniture turn to metal furniture for relief. If you don’t have allergies, you might get used to the smell of wood furniture and the VOCs they emit, but more than likely they’re there. Breathe fresher air and sleep better with steel furniture. The powder coating process used on Can-Am steel cabinets is also environmentally friendly... virtually pollution-free! Unlike liquid paint and stains that release VOCs into the atmosphere during the painting process, no solvents are used in powder coating and unused or oversprayed powder can be recovered, so any waste is minimal and can be disposed of safely. Steel is becoming the designer's choice for colorful, environmentally friendly furniture. Not only do you get the beauty and durability of powder coat, but you can get it in 18 decorator colors. Imagine steel furniture good enough for your living room. Go ahead. Pick your color and let your imagination run wild. With Can-Am White Glove Delivery Service your cabinets are brought into your home or office, unpacked, and the modules are configured exactly as you want them. Once complete, all packing materials are removed. Online quotes do not include the White Glove Service. Contact us to request a quote for White Glove Delivery. Buy direct from Can-Am and you avoid paying any markup that would be applied by retailers. We ship directly to our customers from our facility in Toronto and have been doing so since 1979. That gives us the opportunity to provide exceptional value and deal directly with our real customers - you. You can also be assured of outstanding service and know that when you are ready to order more cabinets, they will be available, whereas dealers often add and drop product lines.